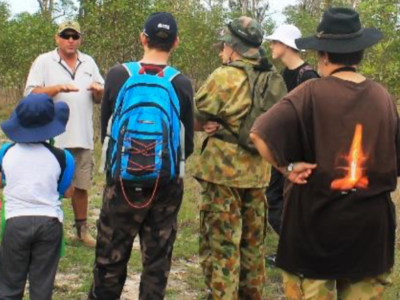 The Hervey Bay and Bundaberg Squadrons got together for a Survival Camp on the weekend of 17th-19th March at Australian Adventure Park, Burrum Heads, Qld. The cadets and officers all had a great time with everyone learning new skills. The cadets completed the requirements of Fieldcraft Class 4 (including a camp log book) as well as some extra survival skills. Part of this included each cadet being given a ration pack that was to last them for the whole day as snacks and refreshments to have between meals. Friday night cadets followed instructions to set up camp and get settled in with all cadets working well as a team to get the tents up before it rained. Saturday morning the cadets learned the basics of navigation using a map and counting out their steps to create a data sheet for their orienteering course. During orienteering, everyone learned the basics of effective radio communication. Both teams took 67 minutes to complete the course that contained some extra activities to be completed at each checkpoint. After lunch, there was some frustration trying to learn different knots but they persevered and succeeded in tying all the knots in the workbook. The cadets and officers then had some fun kayaking and swimming in the dam until mid- afternoon when they were taught techniques in observing their surroundings to discover things in the bush that they might not normally see. This was achieved by scanning foreground, middle ground and distance as well as scanning from right to left. Saturday night, the cadets were taken into the middle of the paddock away from any lights to learn how to see at night without night vision aids. They also experienced how sound travels and how the direction that the sound is coming from can be confusing if you can’t see what is making the noise. They were all surprised when the person they were looking and listening for in the dark ended up standing behind them. Sunday morning the cadets completed the extended obstacle course with three cadets choosing to complete it a second time while the others enjoyed more time kayaking and swimming. Leading Cadet Rhys Sharp proved his exceptional abilities on the obstacle course by completing the 3km course in 18min 56secs. After lunch on Sunday, the camp was packed up just in time before the rain finally poured down. We were very lucky that the rain mostly held off for the entire camp with just a few small showers over the whole weekend. Mr Brendan Guy, who runs Australian Adventure Park, did a fantastic job setting up the various activities and teaching the cadets new skills. Mr Guy commented that we have a “good bunch of cadets and should be proud”. Overall, it was a successful camp that all enjoyed. The cadets should be proud of the way that they participated in all events to the best of their ability and with the way they helped each other out and worked very well as a team.